hey I've got a custom campaign on progress (hope to release the first mission soon) and I added a custom unit: the Armored Guard (a Marine with the skin of the XPRewardMarine); and I added to him the normal attack and armor upgrades. THe problem is whenever I research of those upgradfes (including a custom upgrade which adds 2 base damagfe and 6 vs. Armored) it counts as if it give twice the upgrade (I explain, in the attack upgrade it gives 2 damage and 2 levels to the weapon but is OK: in the Effect field it says "Add 1" not 2, and with the custom upgrade it does not add 2 base damage, it adds 4 but the armored beefic is OK) I don't know what happends and I need help. Sounds like the upgrade effects are duplicated. Try switching to XML mode and check the list. @TheSC2Maniac: Go So it isn't duplicated. I suggest checking the damage effect, something might be wrong. Multiplying the damage using one of the damage factor fields could in theory cause it. I forgot to mention, armor upgrades are also affected by this "rare" bug, also gives 2 armor instead of 1. Another thing. When I enter to the F12 Unit pane and watch my units it looks like it had 2 weapons but in the data it only has one. Solved. I tested the map itself (instead of the mod) and it worked perfectly, the upgrades were OK, everything was OK. 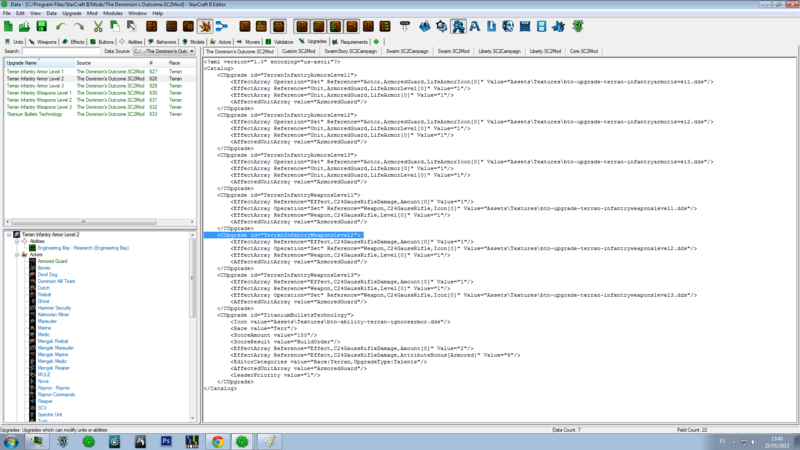 It was that, I think, the Test Document on the mod loaded both the mod itself and the TestMod. Now only takes to erase peranently that "TestMod" but I don't know how to do it. @TheSC2Maniac: Go I toally forgot that possibility. I suffer from it sometimes, when I forget there's already a map set in the 'Test Map' field. Solved without needing to erase the TestMod file.